You will find all of the above in the political wordplay of the past few days. A wordplay that means this. That the politics of this place is still in a jam; stuck and going nowhere. On Monday after meeting British Secretary of State James Brokenshire, Sinn Fein’s leader in the north Michelle O’Neill said there was no basis for new negotiations; no point in endless talks going round and round on a hamster wheel. Then, on Wednesday, MP Nigel Dodds again raised the issue of direct rule ministers. There is nothing in the words to suggest a way out of that Stormont jam, and there is no need for any reading between the lines in the latest blog by Sinn Fein’s national chair Declan Kearney in An Phoblacht – an extract of which is published below. If the rights issues are not settled, then there will be no government. Kearney could not be any more clear. There had been some suggestion that Irish Foreign Minister Simon Coveney may travel to Stormont on Thursday, but I am told he has no plans to do so. In the absence of agreement, the DUP wants direct rule ministers, while Sinn Fein says the onus is on both governments to ensure the implementation of previous agreements. 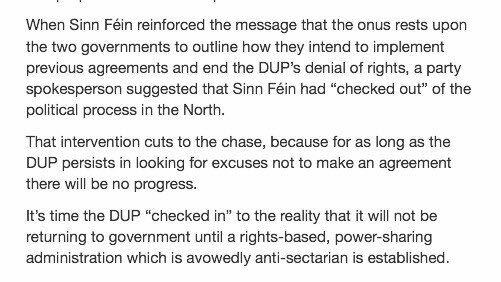 All of the talking to this point has changed nothing and the consequences of that stretch beyond Stormont. The standoff, means political members are not attending the Policing Board and that Board is unable to function as intended. That situation cannot continue and, on another issue, another row has developed in recent days around amnesties and a recommended statute of limitations. That proposal stems from a report by the Defence Select Committee in April, and, there should be no confusion about what it proposed – the enactment of a statute of limitations, covering all Troubles-related incidents, up to the signing of the 1998 Belfast Agreement, which involved former members of the Armed Forces. The Committee encouraged the government to extend this to cover RUC and other security personnel and to consider, after consultation, whether it should apply to all Troubles-related incidents – meaning right across the board. This should be coupled with a truth-recovery mechanism. It would mean an amnesty. 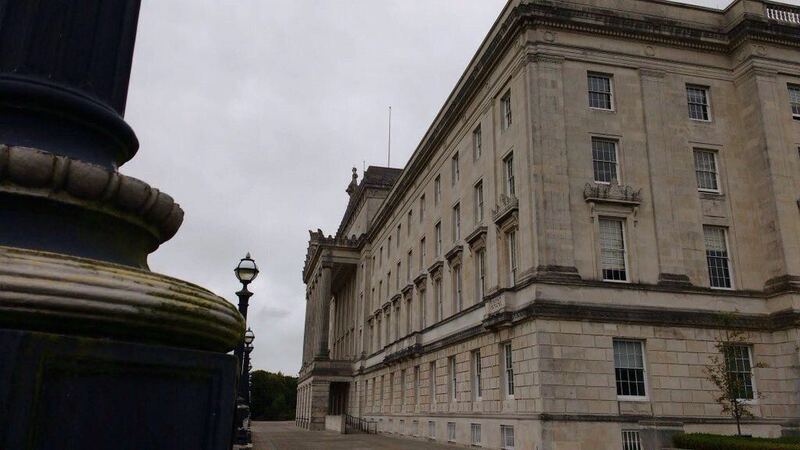 The committee’s proposals are to be included in the upcoming legacy consultation here, in which the government will state its preference for the structure set out in the Stormont House Agreement in 2014. In other words, not a statute of limitations, but a process that would include a new Historical Investigations Unit and a Commission tasked with gathering information for families; but the fact that the consultation will invite responses on alternative approaches to addressing the past, means the political standoff is about both past and present. Read the words of the past few days. Some patch-up won’t fix it.